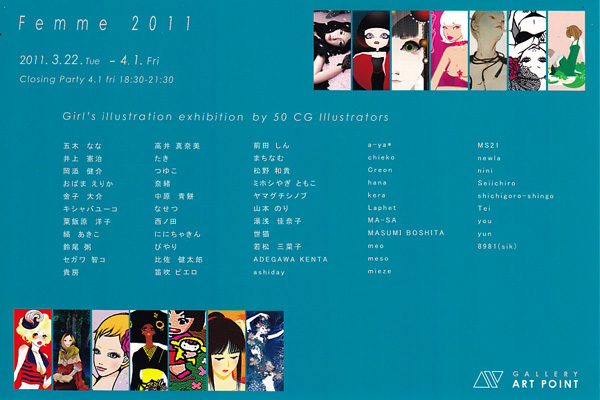 shichigoro-shingo will participate in the Femme 2011- 50 CG illustrators Exhibition – presented by GALLERY ART POINT. “Femme” is a meaning of women in French. Artworks under the theme of a woman by 50 CG illustrators will exhibit in this exhibition. Also, the exhibited artworks will be sold. I will exhibit “f-001” that I drew for this exhibition. If you want this exhibition postcard, please contact by E-mail. I hear that the visitors can vote three pieces of favorite works, and the Artworks which earned most voting number, will be awarded the grand prize, also this gallery will present one artwork to one visitor by lot.